Arthur Oliver Designs: Grand Pas de Deux Tutu; MB Exclusive Dove of Peace and Snowflake Tutu. May 22, 2018 – Announcing Moscow Ballet’s introductory participation in Project Tutu Fashion Show and Competition at the USA-International Ballet Competition in Jackson, MS Wednesday, June 20, 2:00pm. The Tutu.com Fashion Show, attended by world-renowned ballet directors, choreographers, dancers and balletomanes, features tutu creations conceived and constructed by industry professionals for companies including American Ballet Theatre and Moscow Ballet. These are just two of the many ballet companies to display their newest tutu costume designs on live models at the show. 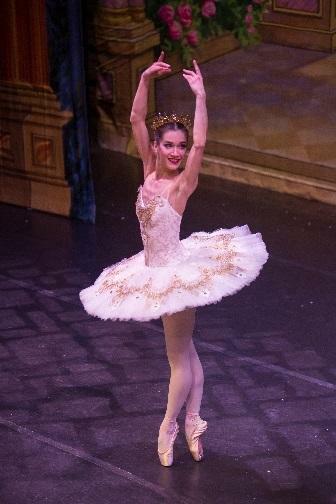 Moscow Ballet will introduce three tutus, all designed by Oliver: Waltz of the Snow Forest tutu with diadem; Dying Swan tutu and headpiece worn for Saint Saen’s Dying Swan in Moscow Ballet’s Musical Wunderkind program; and Masha’s (Clara) golden tutu and crown worn in the Grand Pas de Deux of the Great Russian Nutcracker. “A decided Russian flavor... Arthur Oliver’s costumes were sumptuous, beautifully designed and clever,” remarks Debra Davy, Splash Magazine, Chicago, 2017. Oliver’s signature design for the Great Russian Nutcracker is the 2-person Dove of Peace, a character that is exclusive to Moscow Ballet. “[Petrichenko and Chumakov's] spectacular white Dove of Peace costumes, meticulously designed by Arthur Oliver, further the impact of the performance. Each costume features a feathered wing on one arm so as the two dance together, a single dove is created. All in all, it was one of the most beautiful dances I have ever seen,” writes Natasha Ashley, Broadway World, national, 2017. Christmas Eve 2017 CNN featured Moscow Ballet’s exclusive 2 person Dove of Peace, performed by acro-ballet partners Sergey Chumakov and Elena Petrichenko to critical acclaim. Oliver, who designs all the Moscow Ballet costumes, travels annually to Russia to oversee execution of the costumes in a 300 year old costume and scene shop. Costume Designer Arthur Oliver, Moscow Ballet costume designer for many seasons, travels annually to Russia to oversee the creation of his designs. Oliver receives international critical acclaim for his work and has been seen via internationally broadcast television on four continents. His work is praised by critics such as Ben Brantley of The New York Times and Terry Teachout of the Wall Street Journal, as well as by The Huffington Post, The Boston Globe and The Boston Herald. Awards and Special Honors include Best of 2010, The Wall Street Journal; Featured Designer, In Stitches, The Berkshire Fringe Festival; 2006 Best of the Berkshires Honorable Mention The Merry Wives of Windsor, 2004 Best of the Berkshires Honorable Mention The Comedy of Errors. Proficient in designing for the performing arts, Oliver has designed for Broadway, Off-Broadway, regional theatre, opera, ballet, short film, television and academe. His production of Giselle is currently in repertory for the National Opera and Ballet of Lviv, Ukraine. He has also designed for the American Repertory Theatre, Alabama Shakespeare Festival, Stratford Shakespearean Festival, Shakespeare & Company, Berkshire Theatre Group, At Last Theatre of San Francisco, 59E59 Theatres, The New Victory Theatre, and more. Oliver studied under Alan Armstrong, of UCLA School of Theater, Film and Television, at Stratford Shakespearean Festival, and had his professional debut at Shakespeare & Company in Lenox, Massachusetts. His freelance career features work for Tony award winner Jerry Mitchell, Academy Award winner Olympia Dukakis, movie icon Karen Allen, John Douglas Thompson, Debra Jo Rupp, multiple Grammy winner James Taylor, Tony nominee Alison Fraser, and others. Tutu.Com, founded in 1994, invites amateur and professional Tutu-makers from all over the world to Jackson, MS to be featured in the Project Tutu Fashion Show during North America’s only International Ballet Competition. All competing tutus are featured alongside tutus of current ballet costume designers, vintage tutus and Tutu.com designs at the Project Tutu Fashion Show attended by world-renowned ballet directors and choreographers, dancers and balletomanes. Ballet & Fashion collide for this celebrated event every four years. Tutu.com houses a ballet costume shop; “TutuSchools”, international costuming seminars; a retail division selling costuming books and patterns, as well as all of the fabrics, notions, and appliqués needed to make beautiful costumes. Moscow Ballet – tours annually North America performing acclaimed ballets the Great Russian Nutcracker, Swan Lake, Sleeping Beauty, Romeo and Juliet, Cinderella and more. Known for presenting award-winning Ballerinas and Danseurs, from Lilia Sabitova in 1994 to Honored Artist of Russia Tatiana Predenia in 2002 to Andrey Batalov, former Principal Danseur with the Mariinsky Theatre in 2017, the company performs more than 100 engagements annually across Canada and the United States’ in the finest performing arts venues. In addition to public performances, Moscow Ballet’s North America tours include community engagement programs for all ages and interests. “Dance with Us” shares the Russian Vaganova ballet training with over 6000 American dance students annually bringing them on stage in ancillary roles to perform side-by-side with the professionals. Underwritten by Moscow Ballet, the program was developed by choreographer and co-producer Mary Giannone Talmi. “New Horizons – A Children’s Program for Life” is a cultural immersion program benefitting thousands of children across the country annually and Musical Wunderkind has the Russian principal dancer performing with American youth musician accompaniment. Many Moscow Ballet performances have a fund-raising component for organizations such as hospitals, museums and more.